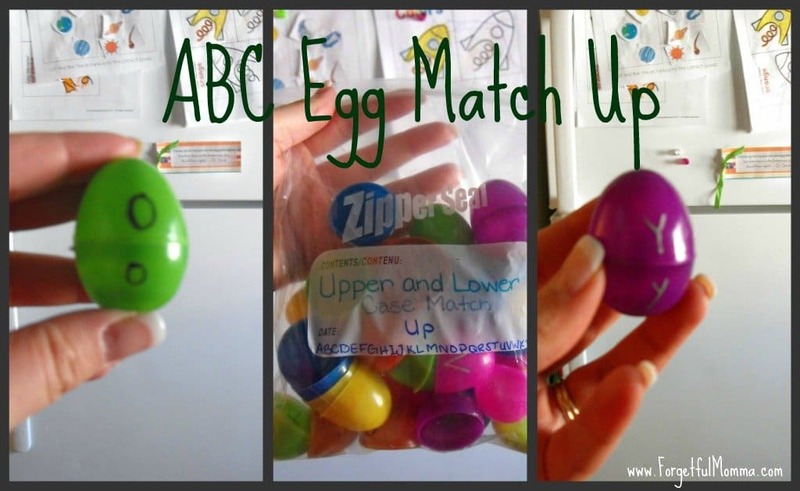 At Easter time last year I bought a bunch of extra plastic eggs with this activity in mind. It keeps them busy for quite awhile. Quiet time for me, fun learning for them. Austin will occasionally come to me with a toy that has a letter on it that she recognizes and points it out, so when I found these little sticky notes at the Dollarama I knew what they would be perfect for, Letter Hunt. I started out with a piece of paper with the upper and lower case of each letter. Then write one letter on one sticky note. Hide them, and let the kids have fun. This is not a quiet activity, nor does it take them that long. It is great to get a burst of energy out. Plus as they learn to recognize their letters, you can give them a blank sheet of paper and let them find the letters on their own. The kids have so much fun over something so simple. Both of these are also perfect for rainy day activities or at Grandma’s house. Next, we’re moving on to include all of the alphabet. Previous Post: « Messy Friday: Baby It’s Cold Outside! The eggs are a cute idea. Seems like an easy boredom buster. Thank you for sharing at Show Off Friday. Thanks for linking up to Family Fun Friday. These look like such fun activities for little ones and I love that the supplies are so easy to find. Thanks for sharing!